Texas requires students to be vaccinated to protect against a variety of viruses before entering Kindergarten; however, parents can apply for an exemption to this requirement for medical or personal reasons. While the number of parents in the state of Texas who apply for and receive the exemption is low (.84%) this average hides the variation that occurs. Austin Independent School District (AISD) has one of the lowest vaccination rates in the state, with 2.2% of its students entering schools unvaccinated for one or more virus. Some schools within Travis County Texas herald exemption rates of 40%, meaning some school sites are in particular danger of infectious diseases. Herd immunity a concept in epidemiology that describes the relationship between the spread of a disease and the percentage of the population (herd) who is vaccinated against the disease. For many diseases, a herd immunity of above 98% is required to stop the spread of an infectious disease. Two preservice elementary science teachers running simulations of measles spreading at varying densities and vaccination rates. Elementary Science Methods (ESM) is a courses taught at The University of Texas at Austin. Students in the class are preservice teachers who will one day soon teach elementary students in Texas - many of whom may be unvaccinated. Over the course of two weeks, two cohorts of students taking ESM (n=40) explored and evaluated GbCC models built by an undergraduate Computer Science Student, Kalpana Vaidya, demonstrating the concept of herd immunity. Realizing the full potential of model-based learning and GbCC, students were given the challenge to author changes to the model to represent three schools with varying vaccination rates: (a) a small, private school; (b) a large, public school in an affluent area; and (c) a large, public school located in a historically underserved community. Students discussed the perceived differences amongst these three schools, and re-imagined the functioning of the models to represent this new scenario. Implicit in these conversations was dialogue on the social factors that contribute to disease transmission and vaccination rates amongst heterogenous populations. While reprogramming a model in three hours is a difficult task; preservice teachers able to engage in rich conversations illuminated the many variables that contribute to public health. The GbCC models served both as a predictive tool for thinking about vaccination rates; but also, an artifact to engage in dialogue with, to push understanding of complex problems further. The Constructionism 2018 Conference held its fifth meeting in Vilnius, the capitol of Lithuania on August 21st through August 25th at the historic Vilnius University. Constructionism is a learning theory developed by Seymour Papert which focuses on having learners construct physical or digital artifacts individually or collaboratively as a way of constructing meaning. Closely tied to the work of Jean Piaget, Constructionism borrows the idea of learners constructing their own individual and internal meaning from the world around them, and ties in the production of physical or digital artifacts to externalize that understanding or meaning. Presenters at the conference demonstrated constructionist pedagogies and interventions using Micro:bit, Arduino, programming languages (Logo, Scratch, R, NetLogo and more), sewable and programmable circuitry, and many more artifacts. Interventions took place in a wide variety of contexts spanning ages, durations, and formal/informal learning environments. The Principle and Co-Principle Investigators for the Group-based Cloud Computing for STEM Education project organized a presentation for a 2 hour workshop hosted on Friday, August 23rd. The title of this workshop was Group-based Simulation and Modelling: Technology Supports for Social Constructionism. Max Sherard, a doctoral student from the University of Texas at Austin, presented the workshop on behalf of the PI and Co-PIs. Modified Wolf-Sheep Predation Model: Participants learned about tri-trophic cascades in Yellowstone National Park, and discussed the accuracy and abstraction of two models developed for students to learn about the relationship between wolves, elk, and aspen tree growth in population stability. Segregation: Participants explored modifying a segregation model built to represent two demographics to incorporate a third demographic, and brainstormed additions to the model to increase the sophistication of the simulation. Disease: The Hub-net Classic model, Disease, was used to demonstrate other architectures to GbCC which increase participation and engagement of potentially younger audiences. Geogebra x GbCC Integration: Participants were able to see the collaboration between GbCC and Geogebra capabilities, and explore the mathematics behind triangles in a collaborative matter. 22 Participants attended the workshop and represented many nations, institutions, and forms of education. Participants closed the workshop by learning about the ability convert any NetLogo model - from the library or a personally created model - to the GbCC platform, opening up the model to collaborative participation. When NetLogo models are converted to the GbCC platform, student artifacts can be created collaboratively and exist in dialogue with each other, achieving the social dimension of constructionist learning. The 2018 UTeach Conference was held in Austin, Texas on May 22 through May 24. In attendance were researchers, master teachers, in-service teachers, and pre-service teachers from around the country at the 44 UTeach replica sites. Dr. Walter Stroup and graduate students Jason Harron and Max Sherard were in attendance at the conference to present progress on work related to implementing Group-based Cloud Computing with pre-service teachers and updates and extensions of the GbCC technologies. The two formal sessions and one informal session which were held throughout the week are described below. Tuesday, May 22nd, Dr. Walter Stroup, Jason Harron, and Max Sherard were in attendance at the Project-based Instruction (PBI) Pre-Conference course retreat. Attending the pre-conference course retreat were faculty instructors of PBI from UT Dallas (2), UT Colorado Springs (2), University of West Virginia (2), and a other institutions (3). Representatives from these institutions introduced problems with their local PBI courses and presented potential solutions to workshop with the group. Max Sherard and Dr. Walter Stroup presented GbCC capabilities as a way to unlock the true potential of PBI by providing an easy to use, easy to author, platform for exploring and learning about emergent phenomenon. Emergence is a way of thinking about many systemic phenomena; for example, how birds flock or how ecosystems change over time. However, teachers and students can find it difficult to explore emergent phenomena in the classroom because of time or resource constraints. Max demonstrated GbCC models developed to explore the extinction of wolves and its impact on elk and aspen populations, and Dr. Stroup demonstrated the new GeoGebra integration which allows GbCC users to flip between GeoGebra and NetLogo within the GbCC platform. A discussion was held after the presentation to generate possible questions pre-service teachers could explore using Project-based Instruction. The PBI pre-conference course retreat was a short 45 minutes. To give people an opportunity to tinker more with GbCC models, a night session was offered by Dr. Walter Stroup and Max Sherard from 7pm until people were ready to leave. A representative from UT Dallas and two faculty instructors from University of Kansas were in attendance. During the time, Dr. Stroup lead the participants in the GbCC Disease simulation (the HubNet Classic architecture) and GeoGebra x GbCC integrated tool (flat architecture). Participants played with models and explored patterns with the graphic outputs. A rich conversation was held around the graph of % infected produced in the Disease simulation. Individuals made predictions around whether hiding the infection icon (and thus representing the presence of a silent-disease carrier) would increase or decrease the acceleration of the rate of infection. Participants made predictions and discussed the implications for teaching math and science content. A participant from the University of Kansas highlighted how the initial conditions in the program produce a profound impact on the results - a feature of complex systems that is relatively could be difficult to discuss in the classroom without an example like this. What happens to genetic diversity of the wolf population upon reintroduction? How do wolf and elk reproduction rates differ - and how does this impact the population? How similar or dissimilar was the reintroduction efforts of the Panther in South Florida? How does the building of a road or other human-made barrier change the dynamics of this model? What about farmers? What are the impacts of humans who hunt and protect their cattle in the Yellowstone ecosystem? Which amount of wolves produces a steady-state equilibrium? What about a dynamic equilibrium? Quickly, participants realized the fractal nature of using GbCC models - users can continually ask more refined questions, and author new simulations to explore these questions - a central feature of Project-based Instruction. Towards the end of the presentation, Dr. Stroup demonstrated the potential of integrating GbCC with GeoGebra, the most widely used online math platform for algebra and geometry. Participants were excited by the model's ability to bring exploration into the variables that produce similar-area triangles, and wanted to see more math examples. On Wednesday, October 25th, Dr. Anothony Petrosino invited doctoral student Jason Harron to speak with his graduate course on Systemic Reform about issues related to the historic segregation and recent gentrification of Austin, TX. Framed through the lens of complex behaviors in systems (Jacobson, Kapur, & Reimann, 2016), the lesson focused on how behaviors of individual agents in a system can lead to complex emergent results. Based on the Schelling-Model of Racial Segregation (1971), the class was invited to explore segregation as an emergent phenomenon using GbCC. By adjusting a variable called “happiness”, circles and squares move around a map until they are surrounded by a user-defined minimum percentage of same colored neighbors. 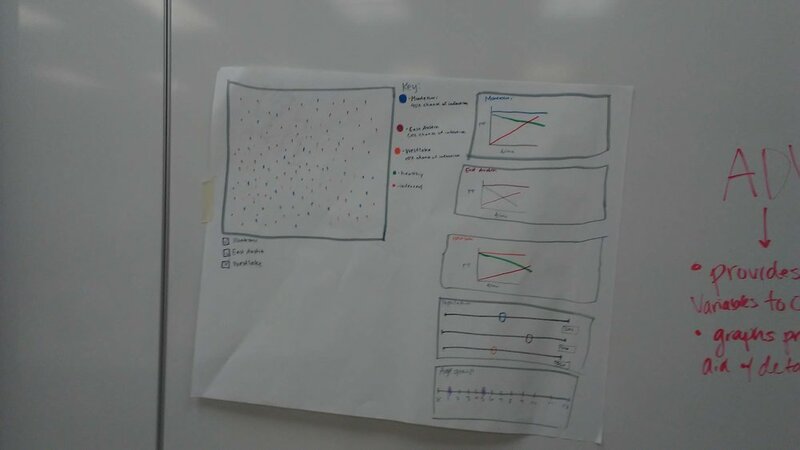 Students are able to adjust the minimum percentage and run the model multiple times in order to test different hypotheses about how the preference for similarity may result in different segregation patterns. Using the gallery feature of GbCC, students are able to share their outcome with the rest of the class. Much like NetLogo, GbCC is an authorable environment, meaning that code can be modified and recompiled. By leveraging this feature, we use the segregation model as our introduction to programming. Students are shown how to modify a single line of code that determines the colors of the circles and squares in the model. As members of the Systemic Reform class played with variables, some discovered that they could add more than two colors, while one student changed the colors to black and orange and kept running the model to see if a UT Austin longhorns logo would emerge through segregation. Why is understanding this history relevant in conversations about systemic education reform? Following this discussion, we investigated the Racial Dot Map (https://demographics.virginia.edu/DotMap/index.html) to take a look at how segregation takes place in Austin and metropolitan and rural areas throughout the United States. For example, students in the class discovered that the graduate housing in the city of Austin was immediately recognizable due the overrepresentation of dots representing Asian students, Other students looked at their home city or towns, with one student commenting that their rural experience was represented almost completely by white dots. What does this agent-based model do well? Not so well? Does this segregation model fairly represent the how segregation takes place in Austin? Why or why not? How can modeling be used to better understand the challenges in systemic education reform? This lesson provided an introduction to how GbCC can be used in a classroom to model and facilitate discussion about social issues in an immediate and localized context. 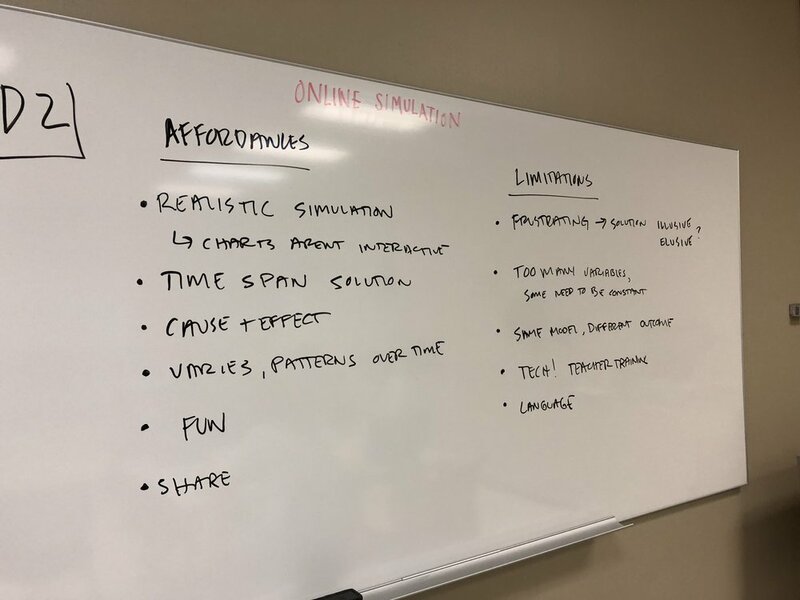 Students were left with the challenge to think about how models and simulations can be used as a tool better address systemic education reform. The eradication of wolves from Yellowstone National Park in the early 1900's triggered a major ecological shift, affecting hundreds of species, which ultimately changed the geography of the park. Sustainable Human, a non-profit organization focused on telling the story of historically rooted sustainability crises, produced a YouTube video titled How Wolves Change Rivers, which explains how the reintroduction of wolves into Yellowstone stimulated the reproduction of a healthy ecosystem. This topic and anchor video were of interest to two middle school science teachers in Nashville, Tennessee. University of Texas graduate students Max Sherard and Jason Harron developed a 4-day unit utilizing the GbCC Wolves and Sheep Predation model to explore the complex relationship between predators, herbivores, and the plant community. By partnering with the two middle school science teachers, over 400 fifth and sixth grade students were able to extend their understanding of food webs, species interactions, and ecological shifts. Over the course of the week, students developed proposals to explain the ecological necessity of protecting wolves from hunters in the Greater Yellowstone Ecosystem. Teachers collected pre- and post-surveys which will be used to gather a greater understanding of how students interact with GbCC models. Interviews with teachers will allow researchers to understand how better to modify GbCC models for teachers' specific content goals. Dr. Petrosino, one of the grant Co-principal investigators - instructed a course for graduate students in the cooperative superintendency and STEM programs. All of the students were en route to becoming a Superintendent at some point in their careers. Dr. Stroup was invited on the 15th of July to demo and discuss the potential for GbCC implementation at the district level. Future superintendents watched an informational video describing the history and development of GbCC and other agent-based modeling technologies and had the opportunity to "play" with the simulations. Future Superintendents spent the hour discussing the implications, challenges, and benefits of district-scale implementation of a group-based web deployed software. The opportunity to demo the GbCC technologies with future district leaders is exciting for two reason: 1) it exponentially increases our radius of implementation - each future superintendent who is interested in using GbCC capabilities in their district has the potential of reaching thousands of students; and 2) it allow us to place our theory and technology in the hands of actual users, to discover more about its limitations and capabilities. The UTeach Computer Science conference is a series of workshops to train teacher trainers (individuals who will train computer science teachers). An invitation was extended to the GbCC team to provide a demonstration of the technologies for the teacher trainers. Teacher trainers were encouraged to play with three simulations; the beauty simulation, traffic simulation, and the infectious disease simulation. Teacher trainers generally seemed to enjoy the program. The leader of the conference announced that using this program would allow teachers to accomplish the modeling in computer science goal. GbCC is useful for teachers using the Advanced Placement Computer Science Standards. Particularly, GbCC provides a platform to teach enduring understanding 2.3: models and simulations use abstraction to generate new understanding and knowledge. Within this enduring understanding are 2 learning objectives and 12 essential knowledge points. By training individuals who will go forth and train computer science teachers, we are increasing the radius of individuals who will use and benefit from the GbCC capabilities. (Traffic Simulation) How do we control our individual light? Are there instructions for that? (General Use) The framing text (description of the simulation) currently exists at the bottom of the model. Justin had mentioned having it at the top of the screen instead, that way students must interface with it before jumping straight into a simulation. Excellent: The structure of 3 presenters was excellent and very engaging. Thank you Stroup et al., Sara and Paige. Austin, the capital of Texas, is known for its music scene, technology industry, major research universities, and liberal politics. However, despite being the liberal stronghold of a majority conservative state - Austin has been ranked the most segregated metropolitan area by the Pew Research Center (Index value of .925). In contrast, the Providence, Rhode Island and Bedford-Fall River, Massachusetts metropolitan area are ranked 233rd (Index value of .611). Complexity theory and 'bottom up' emergent phenomenon help to explain the high level of economic and racial segregation in Austin and cities alike. However, these emergent processes are difficult to communicate. With the help of NetLogo's Segregation model - students can simulate the micro-behaviors that lead to macro-segregation patterns we see in cities across the country. Dr. Stroup, the Principle Investigator of the GbCC for STEM Education project, used the NetLogo Segregation model on March 1st, 2017 in a campus-wide session at the University of Massachusetts at Dartmouth discussing social issues facing the country. The %-similar-wanted slider changes the percentage of preferred similarity between an individual and their neighbors. The density slider allows user to increase the number of agents on patches in the simulation. Students during this demonstration and others like it could modify the parent code by changing the initial ratio of red and green agents in the population. The NetLogo Segregation model has recently been converted into a Group-based Cloud Computing program – allowing multiple users to operate the simulation, make modifications, and share modifications in the Gallery View. The model has been recently used in a classroom interactions course where students were encourage to change colors, add colors, and share their modifications of the code to the gallery.